Okay, maybe I was being too positive about flying in India in my last report. Not that the rest of my experience was bad, it just wasn’t as pleasant as the first leg. From Bengaluru (Bangalore) to Kolkata (Calcutta), and from there to Delhi, I flew JetLite, Jetair’s budget airline. Bangalore’s relatively new airport is already too small. There’s construction going on to expand it. Meanwhile, it’s crowded – at least it was early in the morning, when I was catching the first flight out. Each airline was checking in all its flights in one line, which would be fine if they had enough time – but they didn’t, and so they were calling the passengers for the earliest departing flights to come forward. People with luggage carts tried to wend their way through the crowd, adding to the confusion. Once checked in, though, I went through security fairly quickly. It’s separated into Ladies and Gents, which seems to work reasonably well. Everywhere in India, sparrows – once the commonest city birds — are in decline. 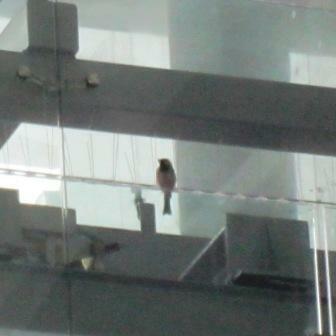 I was delighted, therefore, to find a flock of them have taken up residence in Bangalore airport. The maintenance people may be less delighted; the glass partitions have wire spikes along the top, presumably to discourage the birds from perching on them and streaking them with their droppings. This sparrow clearly didn’t get the message. Jetlite had less legroom than Jetair, but was tolerable. They served no meals, but had sandwiches for sale for Rs180 (about US$3.5) – tea sandwiches between crustless slices of bread, not the American-style monsters. Kolkata airport looked old and tired. Unlike Delhi, the ladies’ loo was appalling. Most of the stalls had squat-toilets, and none had any toilet paper. I believe the airport is due for a re-model, and it could certainly use it. So I’d say it was a mixed experience. However, loos aside, not much different from the experience of flying in the US. With fewer security hassles, and added sparrows. A couple of days later, I flew out of Delhi to return to the US. The only remarkable thing was two levels of security. We went through general security. Then we went through security at the gate all over again (the main difference seemed to be shoe-removal – not normally required by Indian security). Then, as we boarded the aircraft, they checked our passports again. I flew United. The flight was packed, the food was ordinary, and my seat didn’t recline. I thought wistfully of Jetair. 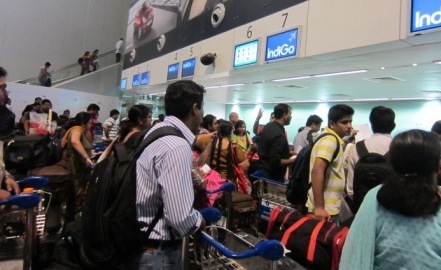 This entry was posted in General, Infrastructure and tagged air travel in India, airports. Bookmark the permalink. Gate security as you experienced it , is mandatory for all Airlines flying out directly to the US . However it nice to see you had a pleasant experience overall on this last trip to India . I’d love to see some sparrows too – they were such sweet little creatures to add to life in the city.